Everyone who uses SoapBox from your company will sign in with this method. Currently you can authenticate with Google, Slack or Microsoft teams. Don’t use any of these? Suggest a different authentication method here. You cannot switch your authentication method after your SoapBox is created. Everyone who uses SoapBox from your company will need to sign in using this method. If you select Google auth, it’s a good idea to use your work email to sign in. 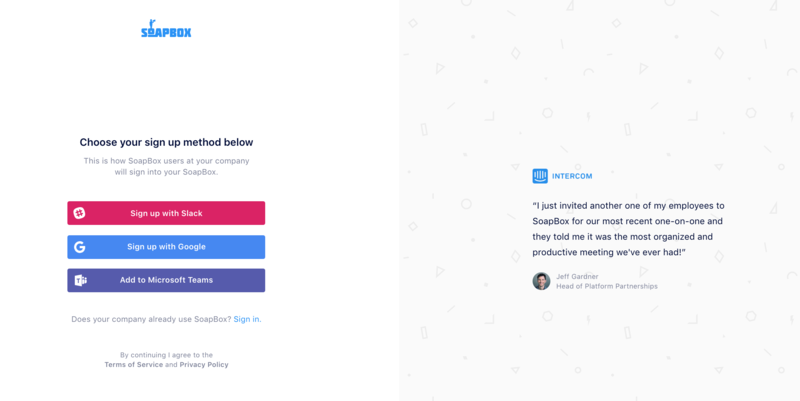 Your SoapBox URL is what your employees will enter in their URL bar to access your SoapBox. E.g “<yoursoapboxurl>.soapboxhq.com”. Note: If you select “Slack” and install the the SlackBot then your URL will automatically default to your Slack community name. Click “Create SoapBox” and voila!